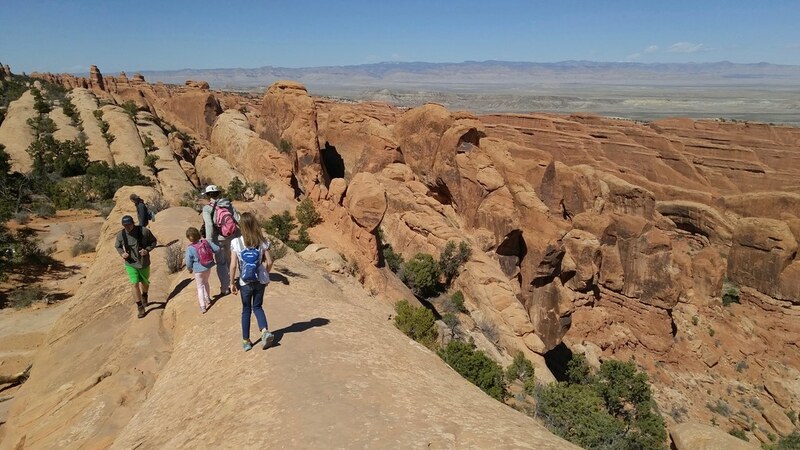 School was out last week, Poudre Schools and Colorado State, and my family and I took a Spring Break trip to hike in Arches and Canyonlands National Parks. We stayed 4 nights in Moab, Utah, the biggest town in Southeastern Utah and 415 miles from Fort Collins. It's a long, but scenic drive, and once we got west of Vail Pass the road was clear of snow and it was all smooth sailing down I-70 to Crescent Junction and then down US-191 to Moab. I grew up in Utah, have family roots in Southern Utah, visited Arches and/or Canyonlands annually in the 70s and 80s, but haven't been to Moab in a long time. 1992 may have been my last visit. The town has changed a lot on the surface and probably a little bit underneath. Moab's espresso machine population has increased about twentyfold and you can walk out of a craft brewery with a 4-pack of full strength IPA. While grabbing some picnic food in the City Market, I heard Built to Spill's The Plan as shopping music. It's weird. Moab panders shamelessly to the forty-something weekend warrior like me. On our first day, we drove into Arches N.P. As you see in the photo below, the dramatic features of Arches are largely found in the brick red Entrada Sandstone that sits atop the buff colored Navajo Sandstone. There's a particular angle when you're driving back towards the park's visitors center and very close to these titanic figures where one appears to be whispering in the ear of another. Something more serious than mere gossip is going on. My kids loved scrambling on the park's characteristic joints and fins. These are created by collapse of a deeply buried salt deposit, the sandstone fracturing as its foundation warps. 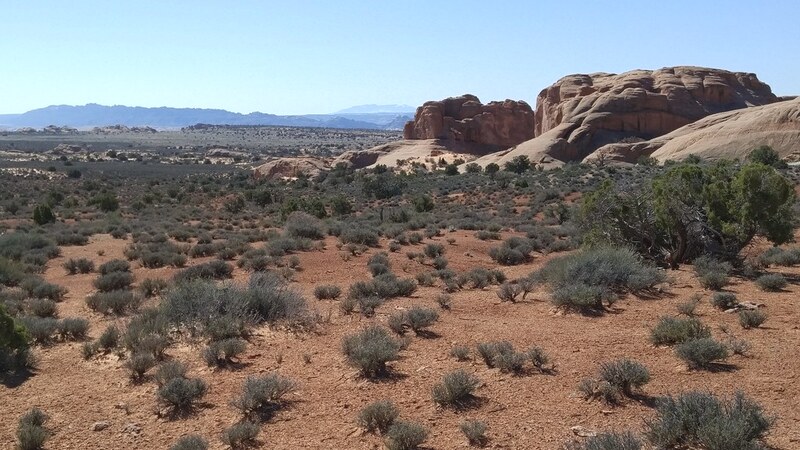 On the Devil's Garden Trail in Arches N.P. Erosion of the fins can produce free standing rock arches. The park touts over 2000 of them. 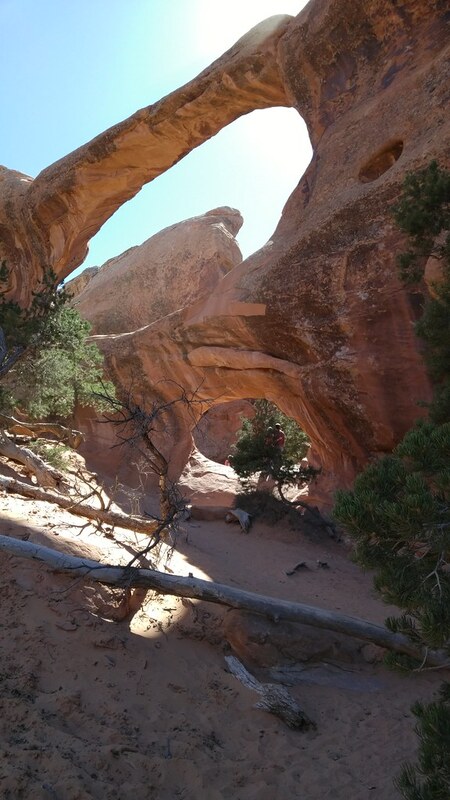 These arches are ephemeral in geologic time; the iconic Wall Arch (in the same Devil's Garden area) collapsed on August 4, 2008. Landscape Arch, the second longest natural arch in the world, is ever more delicate. According to Wikipedia (no source that I can find) 43 arches are known to have collapsed since 1977. We weren't the only family on the trail that day. We weren't even the only family from Fort Collins, and bumped into people we know from school and soccer. 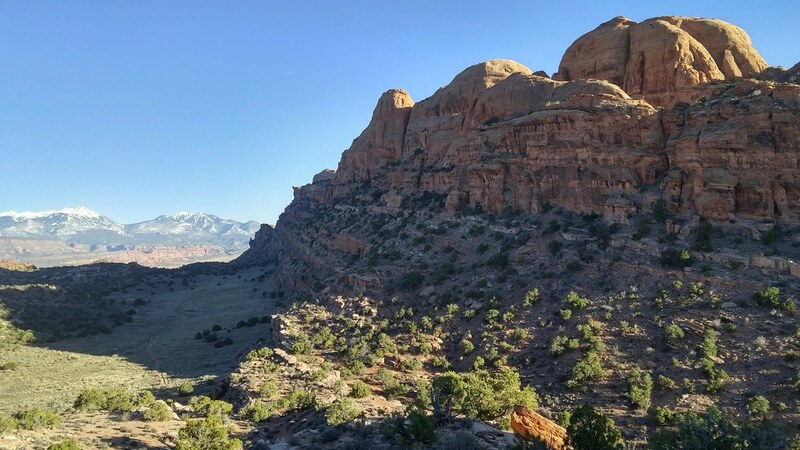 On returning home our oldest learned that her class's student teacher had been to Moab before us, on the earlier end of Spring Break. 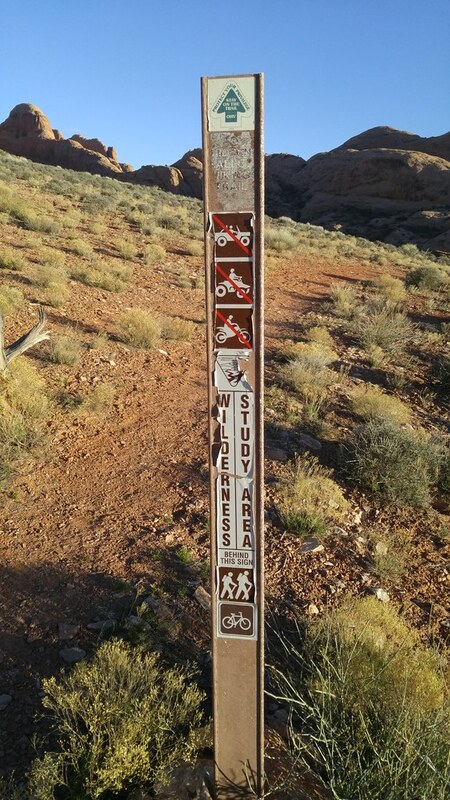 Later that same day I did a 7 mile evening trail run from the BLM's Hidden Valley trailhead up and over the rim southwest of Moab, stopping to check out a few panels of rock art and admire the problems along the Moab Rim jeep trail. There was a point in this run where I realized that I was poorly prepared for any bad turn of events. I'd brought no water, no food, no map, no jacket, no light, and had no internet. I was all alone on the rim, the sun was going down, and the connection between the Hidden Valley and Moab Rim Trails wasn't as obvious as I had expected. 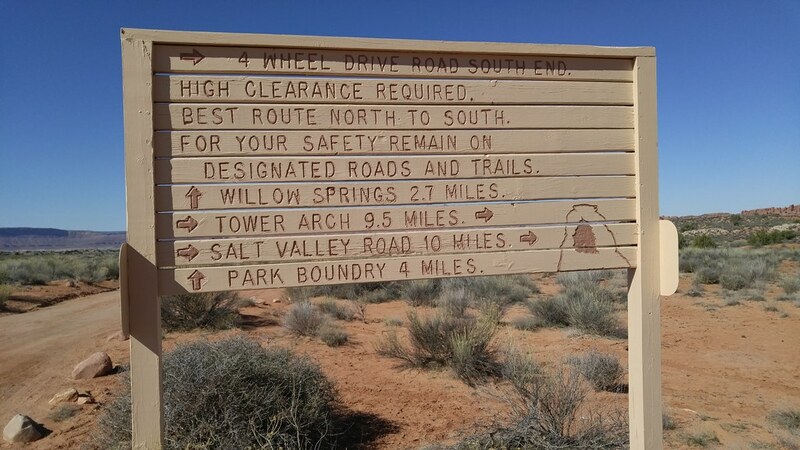 Visions of descending from the rim in the dark haunted me as I lost the trail briefly on a slickrock dome, but I managed to find my way through to the jeep trail and its companion hiking trail, named "Stairmaster." Ruth and our kids picked me up at the finish, 30 minutes later than planned, and we went back into town for dinner. 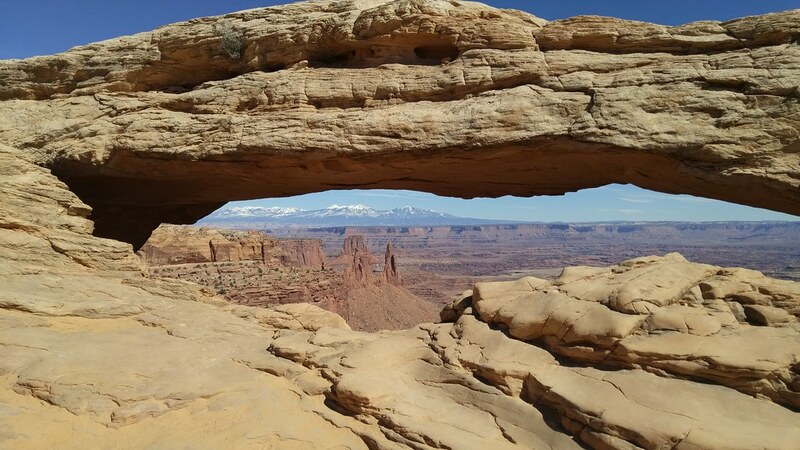 We spent one day hiking in Canyonlands N.P., which was practically empty compared to Arches. 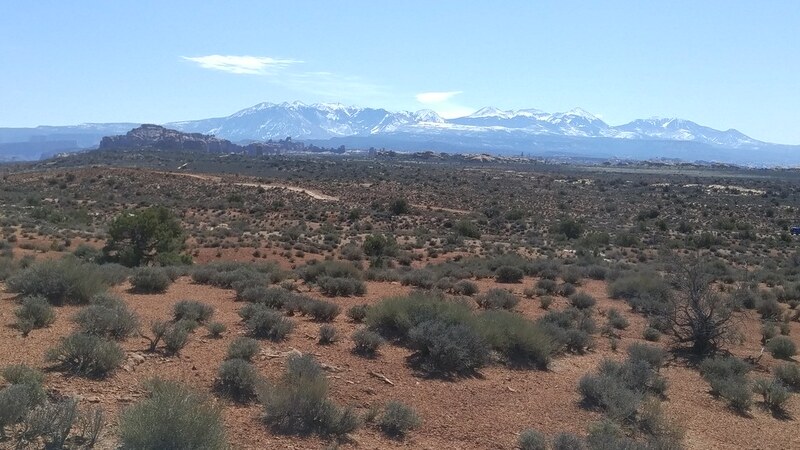 The highlights of this day for me were the clear views of the nearby La Sal and more distant Henry Mountain ranges afforded from the Island in the Sky district of the park. On our last full day in the area we went back to Arches and Ruth and I traded turns at long runs in the backcountry, starting from Balanced Rock. I ran out and back, 14 miles in all, this time with ample water, food, jacket, and map. Just in case. I saw only two other people during my run, a couple touring in their Jeep Cherokee. After they confirmed that I wasn't stranded, we headed our separate ways. I've been on a mission to turn my kids into desert rats and I think I've finally succeeded. Every one of us is looking forward to coming back sooner rather than later. Our admission to the parks was free thanks to Every Kid in a Park, a new White House initiative. Our oldest is in 4th grade and she and her peers can take family and friends to U.S. National Parks through August of 2016. A cool thing about the initiative's website is that the source is on GitHub: https://github.com/18F/ekip-api. Good job, 18F!